Classic Metal Roofs, LLC has over fifty years of experience in the metal roofing industry, and our team has been operating in the unique conditions of New England for over a decade. Your home in East Greenwich, RI deserves the best quality roof available, from design to installation and even repair. That’s what we offer as the outstanding provider of metal standing seam and metal shingle roofs, in addition to roofs made with specialized materials such as copper and zinc. Our aluminum, copper, and zinc materials offer many benefits over conventional roofing materials such as asphalt, and over inferior metals like galvalume and steel. Our heavy-gauge aluminum is composed of 95% post-consumer recycled material, can be installed directly over your old asphalt roof, and can be recycled when no longer useful, significantly reducing building waste. Our materials are also highly resistant to wind, fire, and common water and weather related damages, reducing the need for maintenance dramatically. 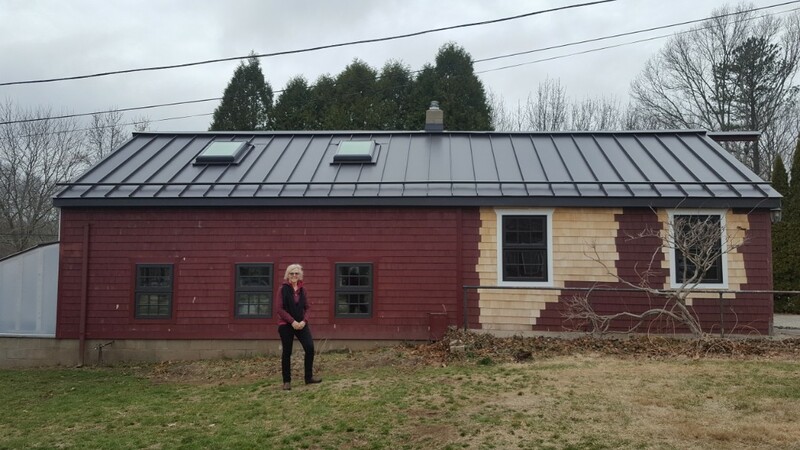 Our aluminum metal standing seam and aluminum metal shingle roofs are also available in a wide palette of durable color finishes, and our copper and zinc materials will develop a natural patina over time for added protection and attractive appearance. Because we have such confidence in our products and services, we offer a Limited Lifetime Warranty on all our roofing systems. While our durable roofs typically need very little maintenance, we have craftsmen with the know-how to perform repairs as well as design and install your new metal roof. Our skilled team is ready and able to create a custom plan to refit your home with the best-performing roof possible. Contact us today for a free estimate by filling out the form on our website, or call us at (866) 303-2002. After extensive review, we chose Classic Metal Roofs as the company best for our interests - and they were. However, upon completion of the project we conclude a little differently - we find Classic Metal Roofs to be so much more than a roofing company - to a person, they are professional, service oriented, tremendously knowledgeable and skilled with each viewing the partnership to mount a roof of such high quality as Classic Metal Roofs offers, as participating in, providing, a true legacy; a lasting testimony to a time when competence, caring and quality all came together for an extraordinary experience. We could not be more pleased nor could we more highly recommend. Aluminum standing seam metal roof in North Kingston Rhode Island is complete.